As mentioned elsewhere, I've been playing Kingdom Hearts. When I saw Donald's attempt to blend in with the underwater world, I knew exactly what this week's open thread picture would be. Probably would have been better if I hadn't had a bivalve mollusk in the background. 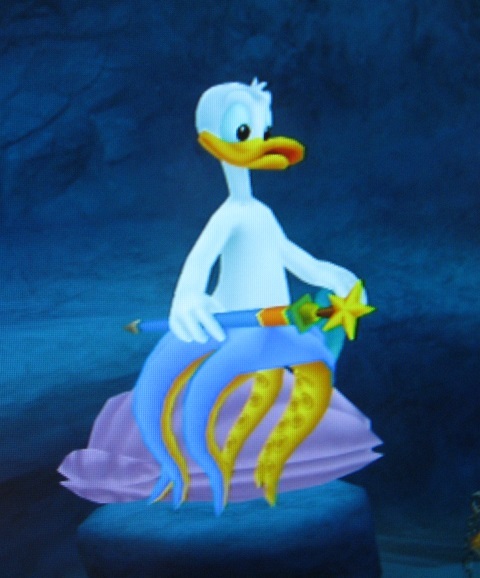 Anyway, Donald here has eight limbs total meaning only six legs, so the he'd be a hexapus/sexapus (depending on if you like Greek or Latin) but Ducxapus doesn't have the same ring. I attribute his tentacles being non-equally spaced to the magic being . . . less than perfectly stealthy. Goofy was a dog-turtle and Sora was a totally mammalian merperson, his lower half seemed to be somewhere in the vicinity of dolphin-ish.